As my regular readers have no doubt noticed, I have started to think a lot more about the food I eat. We have so many food choices here in the west and I think sometimes we just buy ingredients and make or eat our food without paying much attention to each ingredient. For example when was the last time you ever thought about what a particular ingredient is, or who eats it, or to where it is grown, or how long has it been cultivated? Today I’m planning on making Korean Sticky Rice Balls with fruit and nuts to add some sweetness and crunch, and as I was looking at the recipe I realized that I’d never given much thought to the rice that is such a large part of Korean cuisine. In fact rice is a major part of the cuisine of many cultures and it feeds about half the world’s population. It is the most commonly eaten food in the world with one out of every five calories consumed by all the humans in the world coming from rice. It is thought that rice was first cultivated and the domestication process begun in the Yangtze River Valley in China about eight to ten thousand years ago. Humans were eating wild rice before then, but not specifically cultivating it. Other places in China and older dates have been argued by scholars. Recent genetic testing seems to suggest an even older date. So not only does rice feed half the world nowadays, but it has been feeding humans for longer than any other domesticated crop. The domestication of rice ranks as one of the most important developments in the history of the world. The growing of rice gradually spread outwards from China to neighboring countries and then eventually the world. Rice is grown on all continents except Antarctica, although Asian farmers provide over 90% of the world production. In the United States over 100 varieties of rice are grown, mostly from six states, California, Louisiana, Arkansas, Texas, Mississippi, and Missouri. Rice is a type of grass, like wheat and corn. The first domesticated rice was Oryza Sativa. 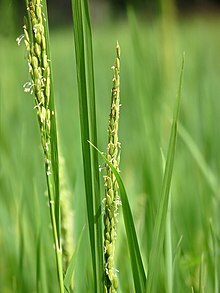 (Much later another type of rice was domesticated in Africa called Oryza Glaberrima.) Through natural selection and crossbreeding there are now thousands of varieties of rice grown in over one hundred countries. Oryza Sativa varieties of rice can be roughly divided into four categories, Indica, Japonica, Aromatic, and Glutinous. Please note that Glutinous means sticky in this context, not that it contain Gluten. Indica is a long grain, non sticky rice that can be grown in drier conditions. Japonica is a medium grain sticky rice that grows in wet conditions while Aromatic rice is medium to long grain with a nutty aroma and taste. Glutinous rice is short grained and very sticky and is sometimes called sweet rice, not because it itself is sweet, but because it is favored for dessert recipes. . Rice is described by its grain length, stickiness, aroma, texture, and flavor. Wild rice is actually unrelated to rice and is Zizania Palustris. The flavor and nutritional value of rice can also be changed by the process it goes through before reaching the local store. White rice is the most processed and least nutritious, while brown rice is far less processed and has the bran layer left intact, therefore increasing its nutritional value. Brown rice takes longer to cook and doesn’t store as well as the oil in the bran layer can go rancid. Brown rice is rich in nutrients, vitamins and minerals. There are other varieties of rice that are increasing in popularity in the west, notably the colored varieties. Black rice, sometimes called Forbidden Rice, because it was once reserved for Chinese Emperors, purple rice and red rice, have all become more easily available. These are all more healthy rices and black rice in particular is full of antioxidants and is rich in anthocyanins which are what makes acai and blueberries so good for us. In Korea rice is still a staple food even with the influx of ingredients and cuisines from around the world. In many countries as people have more money they tend to eat less staple foods and eat a larger variety of different foods. In Korea rice is a symbol of life and prosperity and historically how much rice you had stored was an indication of your wealth. Many types of rice are eaten in Korea and there are numerous delicious rice recipes to try, but even if you only have white rice and Kimchi and are sharing it with a friend it becomes more than just a meal, it becomes symbolic of deeper meanings. Koreans do not like to eat alone. Eating and sharing food is an important part of their culture that is hard to explain, it is more than eating, or an invitation to friendship, it is perhaps an acknowledgement of the importance of eating and companionship to life. Recipe. Sticky Rice Balls with Dried Fruit and Nuts. Heukmi Joomeokbap. Place 1/4 cup of black rice and 1 cup of glutinous (sweet) white rice in a bowl and rinse and drain two or three times. Cover the rice with water and let it soak for at least 5 hours. Cut the dried fruit and nuts up into small pieces. I used mixed dried fruit, dates, and walnuts. In Korea you would be more likely to find jujubes, chestnuts, and pine nuts. You need about 1/3 of a cup total of whatever mix of dried fruit and nuts you’ve decided to add. Put the dried fruit and nuts to one side while you drain the water from the soaking rice, keeping 1 cup of the liquid. Put the drained rice in the rice cooker along with the dried fruit and nuts. Add 1 tsp of good salt, 1 tsp dark sesame oil, and the saved water. Mix well and let the rice cooker do its thing. When it is cooked transfer to a bowl. If you are eating it as a side dish it is now ready to eat. If you are making sticky rice balls, place some plastic wrap on the counter, about 6 inches is more than enough. To make the process a little less sticky sprinkle some good salt on the plastic wrap. You might need to wait a few minutes for the rice to cool just enough so that you can safely handle it. Place a small dollop of rice in the center of the wrap then gently bring up the sides of the wrap to enclose the rice, twist the wrap and it will pull the rice together into a ball. Unwrap ball and place on a plate or in container. You can also slightly squish the ball to make into a pattie which you can then fry gently to heat up as a side dish. Depending on which fruit you use this is not a really sweet snack, although it is tasty and very healthy for you. Use within a day, or freeze, as rice doesn’t really taste so good after a while. Ingredients. 1/4 cup black rice. 1 cup glutinous white rice. 1 cup of the saved soaking water. 1/3 cup mixed dried fruit and nuts. (not peanuts) 1 tsp good salt (sea or kosher etc) 1 tsp dark sesame oil. Apart from having to plan ahead to soak the rice sufficiently this is quite a quick and simple recipe. Changing which dried fruits and nuts you use can change the taste somewhat. I plan to try adding dried cranberries or dried tart cherries for a Thanksgiving side dish to go with a turkey, or even a pork roast. ← Banner Time: Making a Fan Banner for a Kpop Concert.